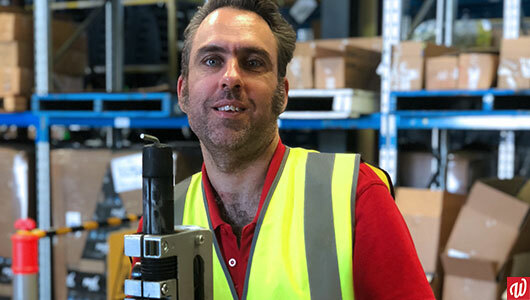 Today’s story comes from Andy in our Planning and Coordination team – he’s supporting Andre who has come a long way in his new role as Production Assistant. He fills us in on the details! As part of his support, we have regular plan meetings so Andre keeps track of his progress towards his NDIS goals. At our last meeting I was so impressed to hear the amazing things he’s achieved in the past 12 months. Andre joined Packaging & Warehousing at Belmont in 2004. He recently became a Production Assistant and is thriving in his new role. This position is key in making sure things run smoothly every day. Alongside the extra responsibility Andre trains alongside our Employment Training Officers (ETO) and works closely with all employees and support staff. Throughout this year, Andre has been a positive and outstanding role model to his coworkers. He can operate everything at Belmont, from our scales to the electric pallet jack! Andre is also capable of completing whole contracts which are usually broken into tasks shared among the team. This includes our contract with Maxade drinks which are checked for quality, packed on pallets, then wrapped and labelled. He even assists with unloading the trucks that deliver equipment for our contract with the Department of Education. Despite his role, Andre says his favourite part about work is helping his teammates, which is great to hear. He acts as a mentor to his fellow team members, helps train them on various jobs, and is a positive influence on others. In the next few years Andre wants to focus on improving his positive communication, leading small teams, and working independently as a Production Assistant. Well done Andre on your incredible progress! I can’t wait to see what else you get up to in the future. Our social enterprises offer a range of employment opportunities for people of all interests, goals, and abilities. Find out more info here, or contact us on 1800 610 665 or via email.